I’m very lucky to live in a part of Orange County where delicious new food establishments seem to be popping up all over the place. I had heard a lot of great things about the Fireside Tavern in Costa Mesa for quite some time now and the Englishman and I finally decided to give it a shot. 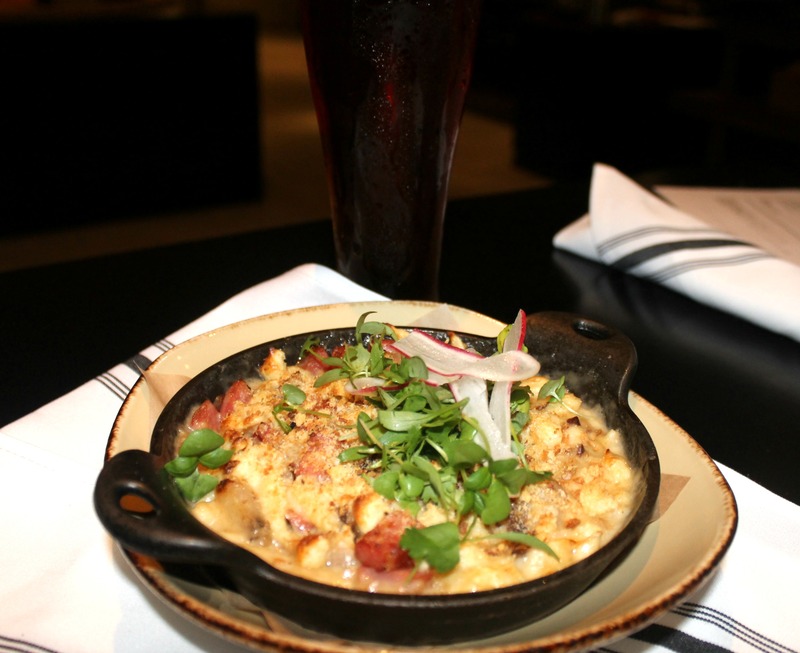 What makes Fireside Tavern unique is that it is located inside the Crowne Plaza Hotel. 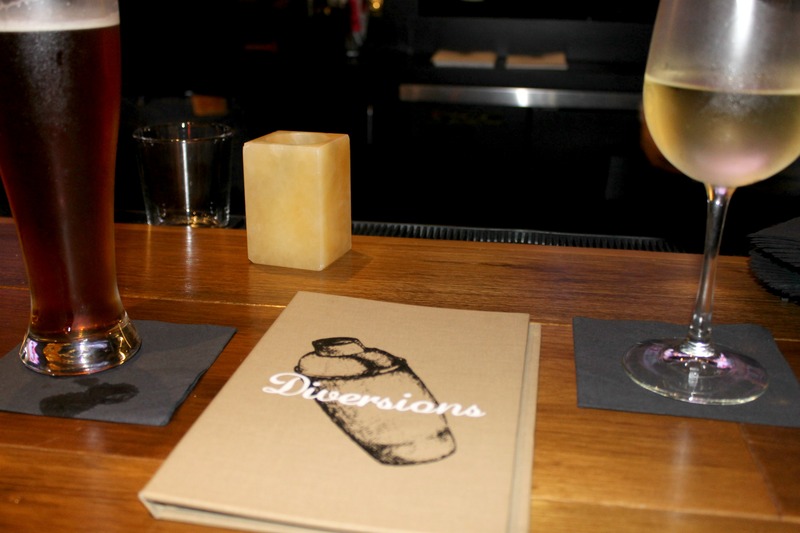 I’ll admit, I was first turned off by the idea of dining at a hotel restaurant, but after reading that Chef Scott Brandon (who also opened The Crow Bar and Kitchen and Linx) was behind the helm, I decided to go check out Fireside Tavern with an open mind. The restaurant has a nice, cozy pub feel to it and a great outdoor patio space so it almost feels like you aren’t in a hotel at all. The bar offers a variety of different beers on tap, a selection of various wines and some signature cocktails. The Englishman and I decided to dine at the bar and started our evening off with a glass of wine and a beer. 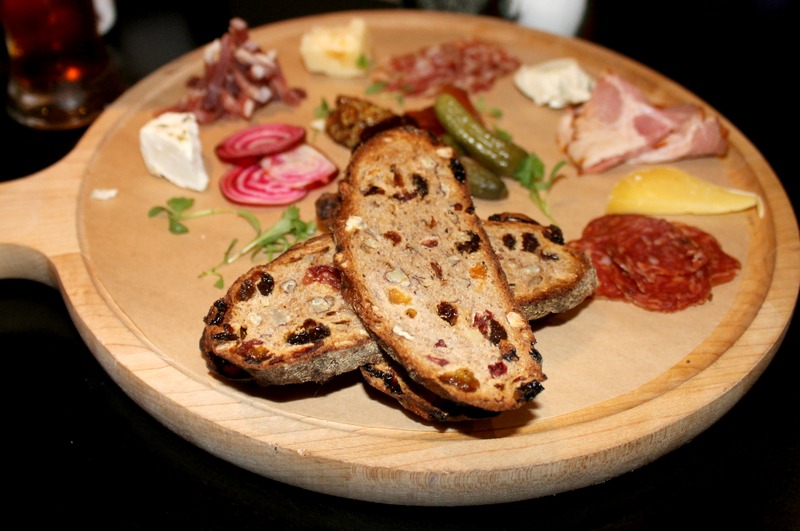 For our starter course, we went with the Charcuterie and Cheese Board which came with a variety of different cheeses, meats and a grilled seedy bread. This board had a great selection of meats and cheeses and was the perfect start to our meal. I would’ve liked to have seen what cheeses were included on the board (I think it was goat, blue, gouda and cheddar) but it was still tasty regardless. For dinner, the Englishman went with the Tavern Mac n’ Cheese which was cooked in a small cast iron skillet and came with homemade noodles and sausage and a variety of different cheeses. I don’t usually order mac n’ cheese at restaurants and only had a couple bites of his, but it was good. The sausage and cheese complemented each other perfectly and I loved the peppery watercress that was placed on top for garnish. I went with the Tavern Cobb which came with egg, avocado, bacon, turkey, lettuce, tomato and cheese. 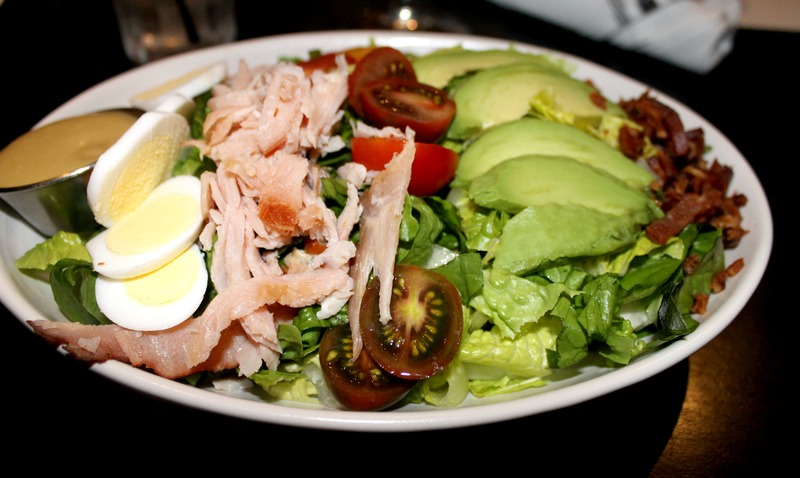 Cobb salads aren’t necessarily the most exciting thing to order, but when they are good, they are good. This one was good. The turkey and bacon both had a nice smoky flavor to it which really enhanced the salad. 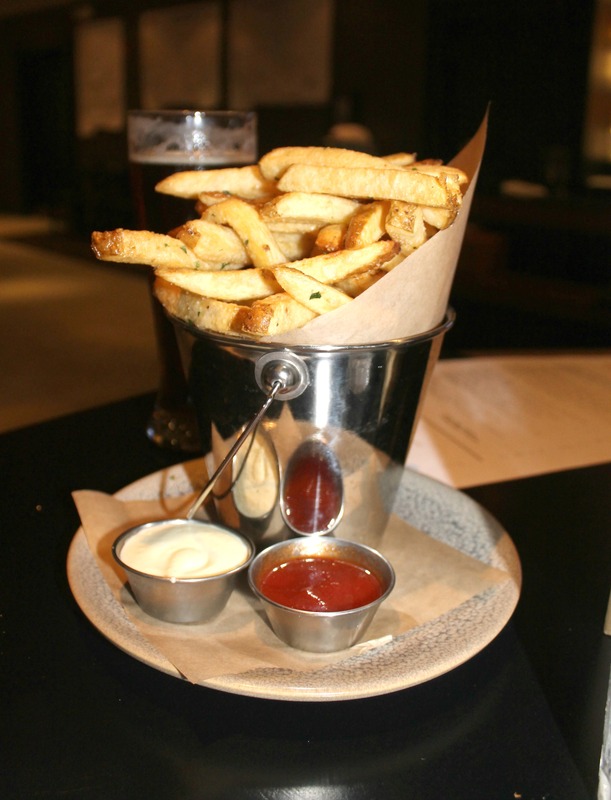 We also split an order of the Hand-Cut Fries which came with a spicy ketchup and lemon aioli. I loved the little spicy kick that came with the ketchup and thought the fries were cooked to perfection and perfectly seasoned. I don’t know if it was just because we had gone for a 7 mile run earlier in the day and I was craving salt, but the fries were some of the best I’ve had in a long time. 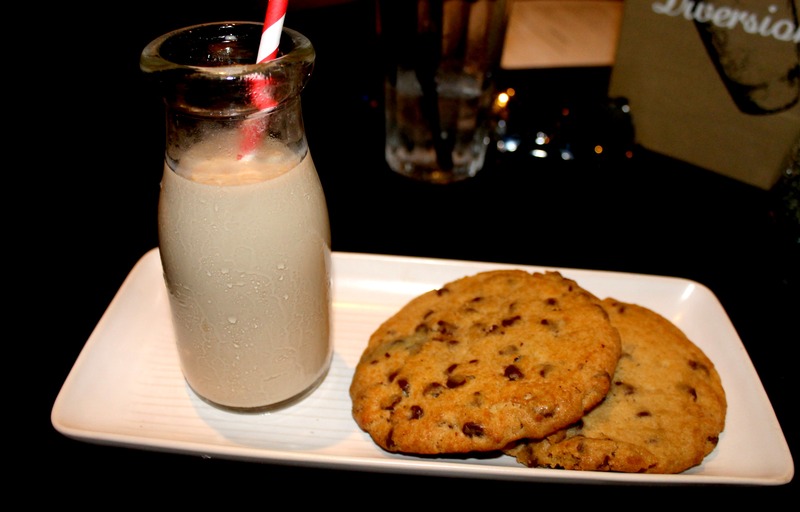 When it came to dessert, I wasn’t feeling inspired by any of the options, but when our waiter told us that the Adult Milk and Cookies came with freshly baked chocolate chip cookies made in-house I was sold. I’m convinced nothing beats a delicious chocolate chip cookie and these cookies delivered. They were warm and had the right balance of chewiness and crispiness to them. I wasn’t the biggest fan of the adult milk made with baileys and vodka, but it was a fun spin on a classic childhood dessert. I was really impressed by the Fireside Tavern. I love that they do happy hour 7 days a week (from 3-7!) and have a seasonal menu. I can definitely see myself returning here and trying some of their other offerings like the roast chicken, burger and grilled cheese. And of course the fries. 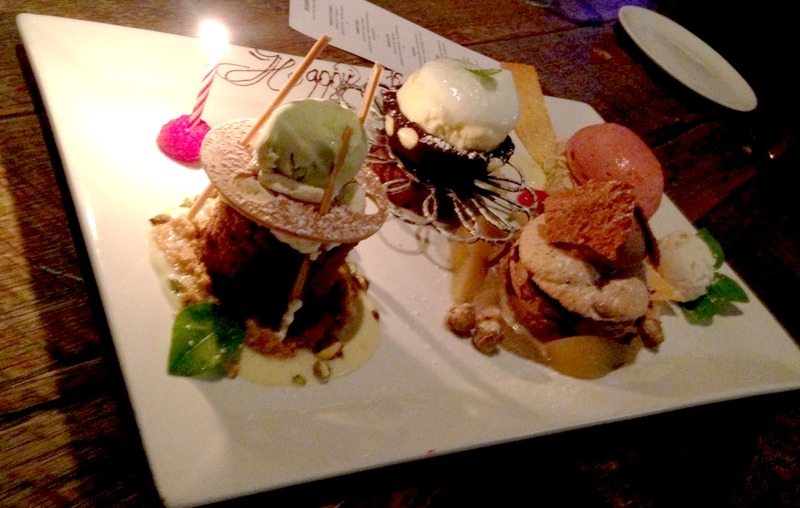 This entry was posted in Best Of, Dessert, Dinner, Gastropub, Good Eats, Orange County and tagged costa mesa, seasonal on September 25, 2014 by allie@sweetpotatobites. This past week I traveled to Toronto for work. Since I was only there for roughly 48 hours I didn’t have much time to explore the city, but I still managed to have quite the delicious dinner at Brassaii. When I traveled to Vancouver in January I had a couple of great dinners, so I was hoping that my experience in Toronto would be similar. I had read mixed reviews about Brassaii, but saw that it was one of the hot spots for the Toronto International Film Festival, so I figured if the food was sub-par at least I’d maybe get some stargazing. I have to say that my dinner at Brassaii exceeded all expectations. The service was superb, the food was on point, and my coworkers and I were able to chat with executive chef Marcus Monteiro and pasty chef Mark Cheese which was a nice bonus. 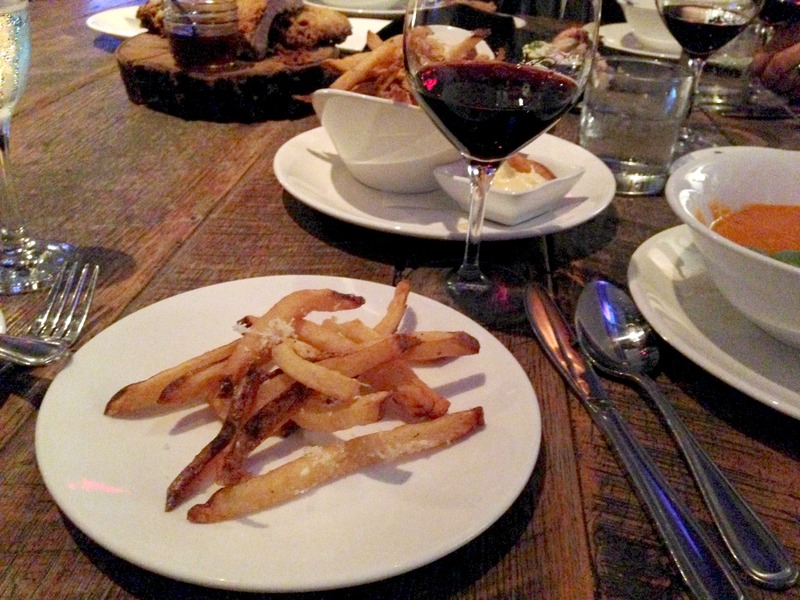 After ordering a bottle of wine, we decided to start our evening off with a few appetizers to share amongst the table which included the crispy ribs, popcorn shrimp and the house cut-fries. I normally don’t eat a lot of gluten because it doesn’t sit well with me, but crispy ribs were too good to pass up. 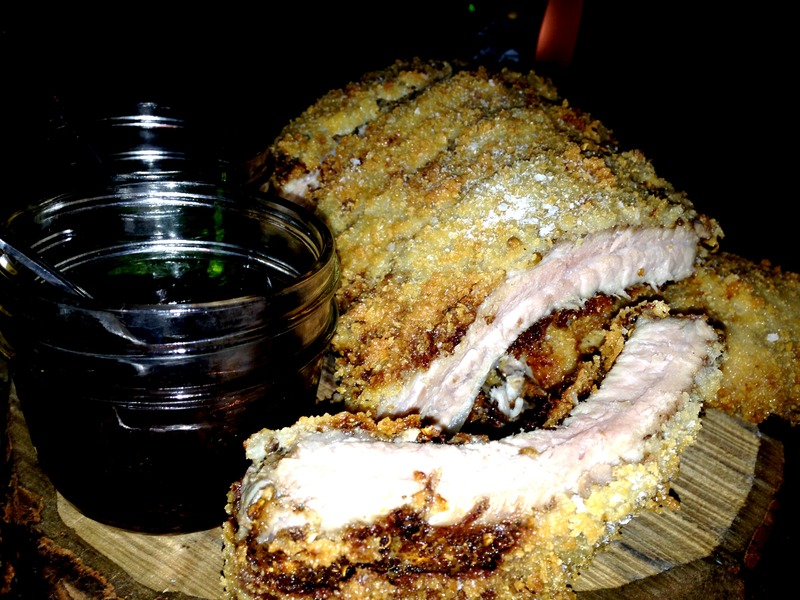 They were coated in panko breadcrumbs and came with a Moroccan glaze and mint chutney on the side. The ribs were definitely a highlight of the night and I’m determined to recreate the Moroccan glaze at home. 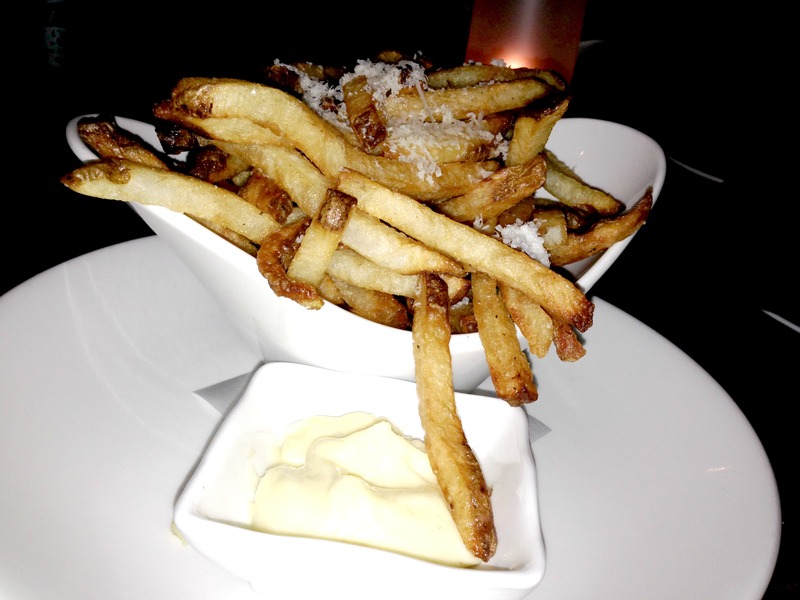 The house cut-fries were also quite good, but really when are fries not good? I enjoyed the parmigiano-reggiano sprinkled on top as well. I didn’t get a shot of the shrimp, but it was tasty as well. A couple of people ordered the tomato soup which I managed to steal a bite of. It was creamy with a nice kick at the end. 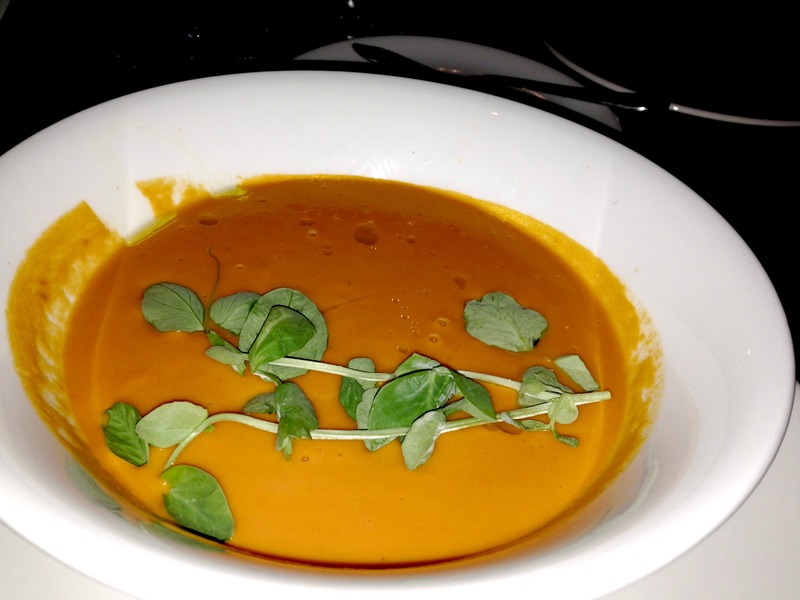 One of the better tomato soup dishes that I have tried. For my entree, I decided to go with the pan-seared halibut which came with cucumber stewed vegetables and micro-greens. Last time I had fish in Canada I was quite impressed and this halibut did not disappoint. It was light, flaky, and the fish melted in my mouth. I LOVE cucumbers, so the cucumber stewed vegetables complimented the fish nicely. 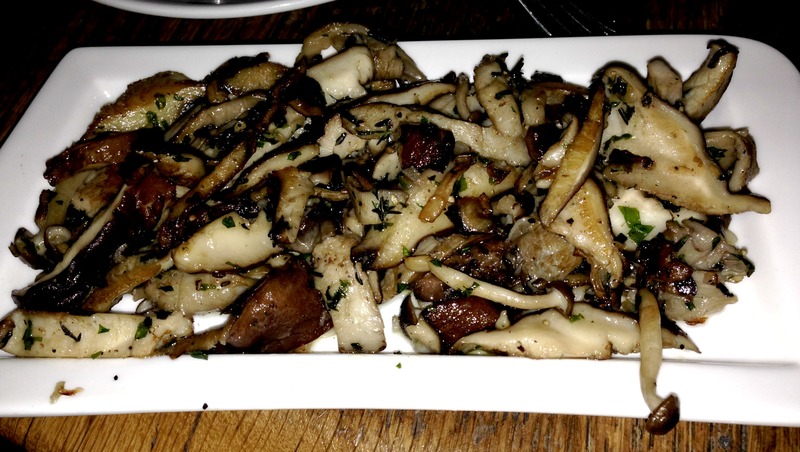 I also had a side order of wild mushrooms and garlic which was also very tasty. 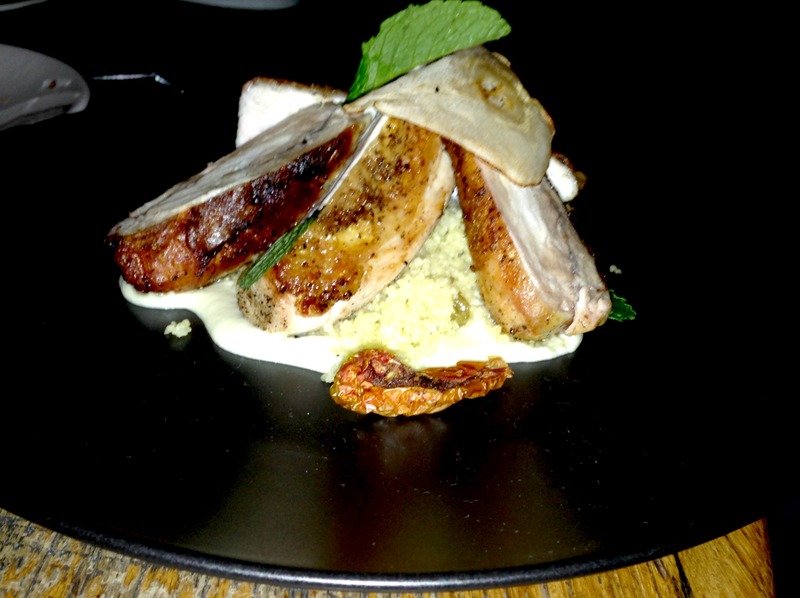 My coworker got the chicken stuffed with breadcrumbs, sundried tomato and mint and came with a side of couscous. The chicken was juicy and prepared perfectly. A couple other people got the striploin which I did not try, but I heard nothing but good things. Then it was time for dessert. Pastry chef Mark Cheese was kind enough to treat us to a dessert sampler platter which was out of this world. Everything was so good that it was hard to pick a favorite, but the standout for me was the Hazelnut Crunch made with roasted pear, hazelnuts, gianduja cream and espresso sauce. Second favorite of the night was the carrot cake with yogurt cream, pistachio ice cream and valhrona blond dulcey. 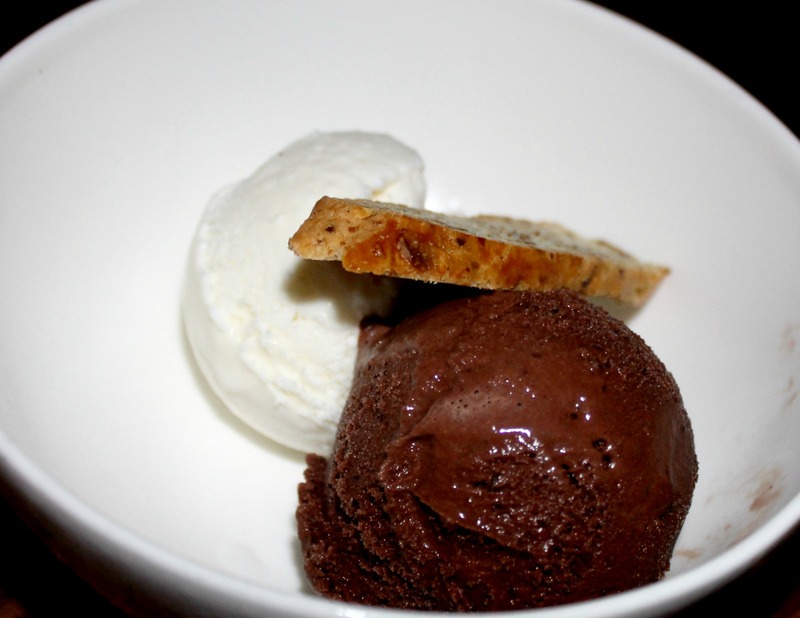 If you ever find yourself in the Toronto area, be sure to check out Brassaii. Chef Monteiro prides himself on updating his menu frequently, so every time you dine there you’ll get the best of what’s in season. Thanks to the team at Brassaii for a great dining experience! Hopefully I’ll be able to return again soon. This entry was posted in Best Of, Dinner, Good Eats, Travel and tagged Canada, seasonal on September 15, 2014 by allie@sweetpotatobites. 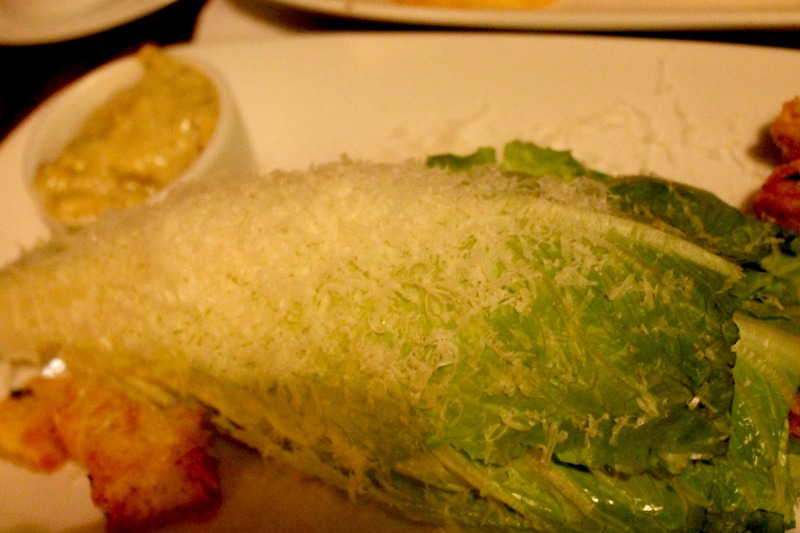 I realized it’s been quite some time since I reviewed an Orange County restaurant on my blog. In fact, the last time I wrote a review was back in October! Between wedding planning, work travel, and recipe development at home, I just haven’t been dining out as much. 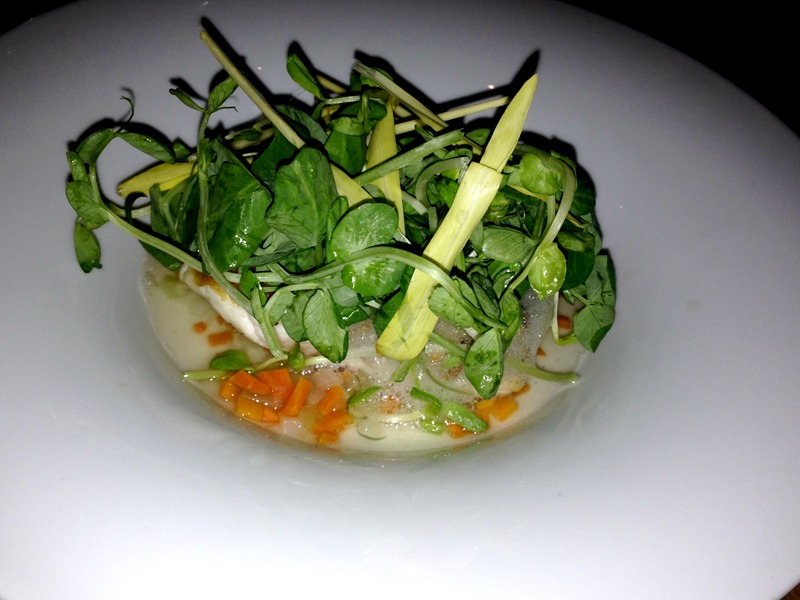 This past weekend though I did make it out for a delicious dinner at Lark Creek Newport Beach. The Englishman and I have heard nothing but great things about Lark Creek Newport Beach and decided to treat my parents to dinner there since they were big fans as well. The restaurant is located in Fashion Island and has a wonderful outdoor patio area complete with fire pits and nice couches. Since it was a bit chilly out we opted to dine inside, but I can definitely see myself returning in the summer for some cocktails and food on the patio. 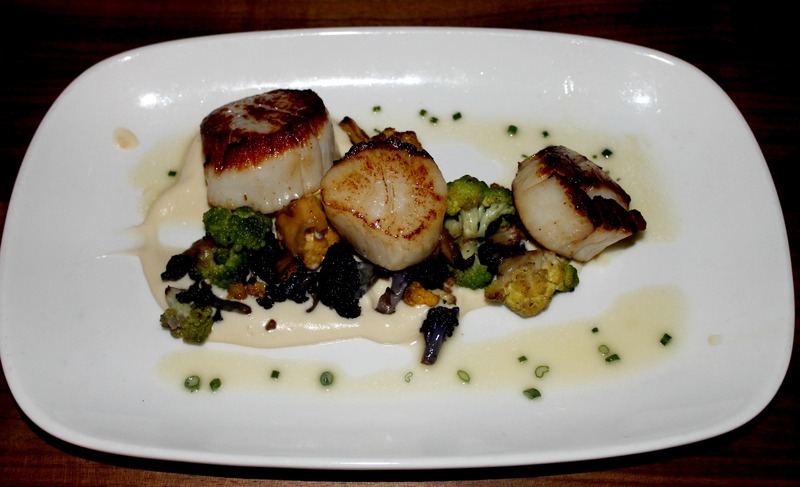 The menu at Lark Creek Newport Beach focuses on seasonal cuisine which I happen to love because not only does the menu change frequently, but it also means you are getting the freshest produce available. 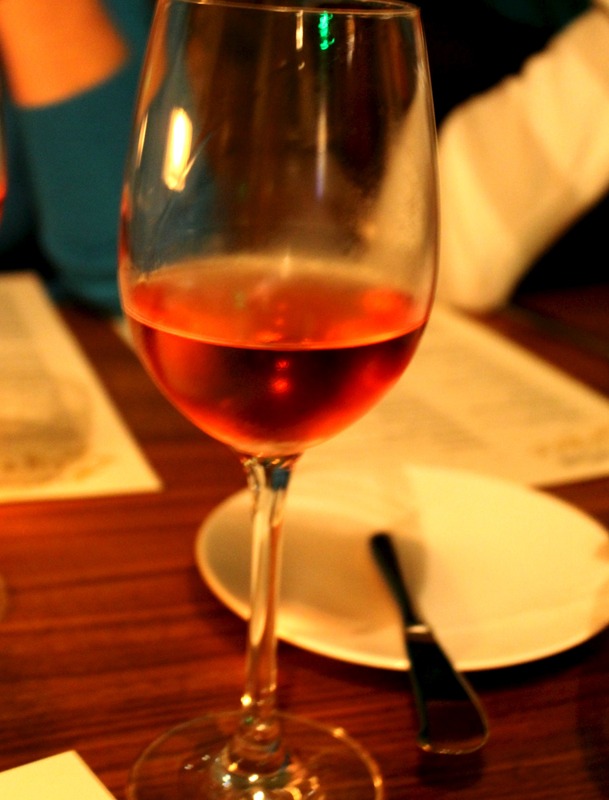 We decided to start our meal with a bottle of Rose, since the Englishman and I are obsessed after traveling to Oregon this summer. 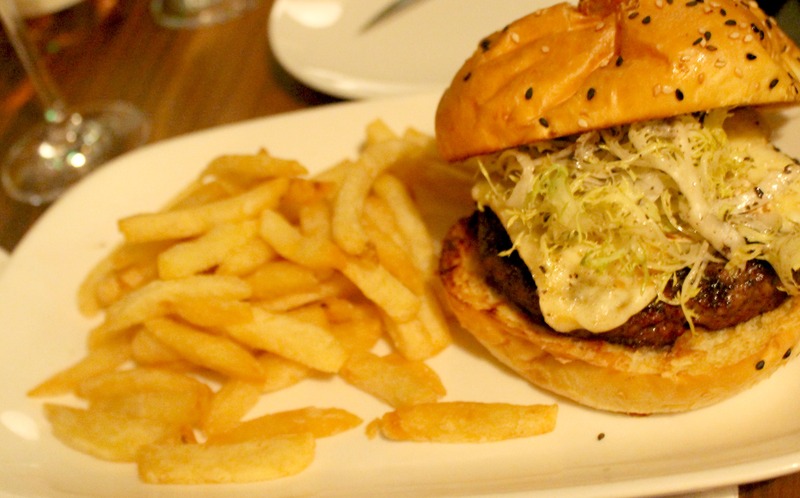 For our entrees, I had my eye on the Truffle Burger so I ordered that as well as the Caesar Salad and split both with the Englishman. 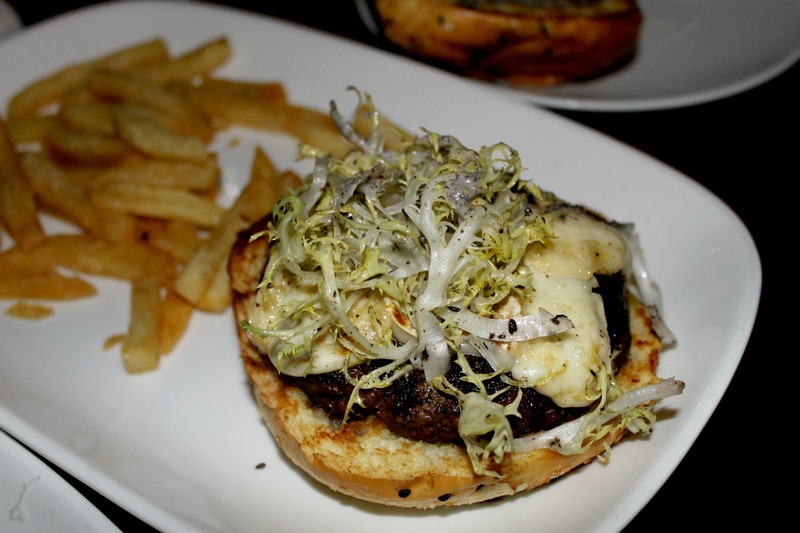 The burger was topped with black truffle cheese and truffle aioli and was cooked perfectly. The fries on the side were a nice complement as well. My only comment is the burger really wasn’t big enough to share between two people, and at $23, I felt the price was a bit steep for what you got. The Caesar Salad was good, just your basic salad. It was good that we ordered this as well since the burger was on the small side. My mom ordered the Day Boat Scallops which were melt in your mouth good. Just like the burger, the scallop dish was on the pricier side ($25) and she only got three small scallops and cauliflower puree. I would’ve liked to see a little more for the price. 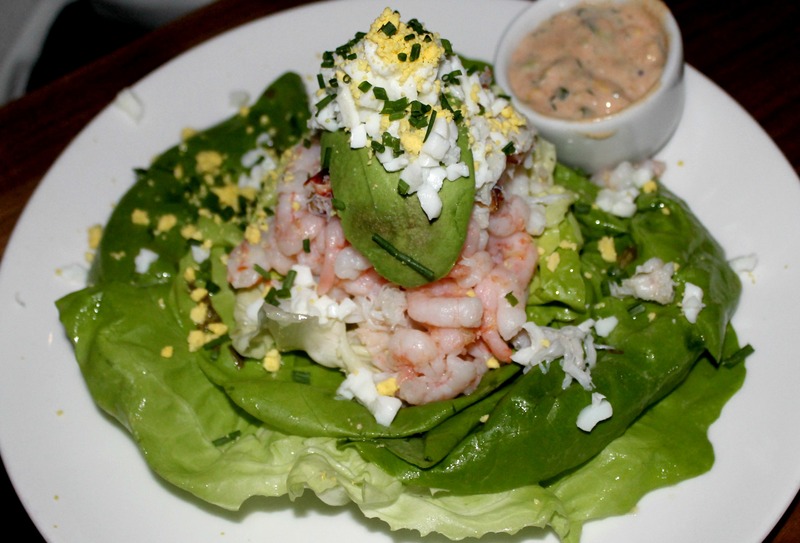 It’s currently Crab Month at Lark Creek Newport Beach, so my dad ordered the Combo Louis Salad ($19) that came with dungeness crab, shrimp, lettuce, avocado and egg. I happen to love dungeness crab so I snuck a couple of bites of his salad and they were delicious. For dessert we ordered profiteroles, which were stuffed with caramel ice cream instead of traditional cream. 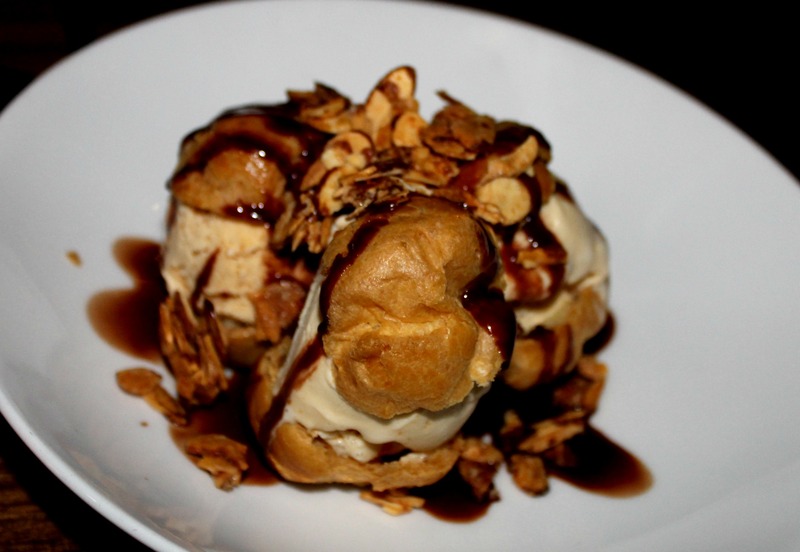 The pastry was light and flaky and I loved the ice cream inside of the profiteroles. We practically licked the plate clean. And since it was an ice cream kind of night we got a scoop of chocolate and vanilla. Not the most exciting choice, but delicious nonetheless. I really liked the food at Lark Creek Newport Beach, but I did feel some items were over priced, and I have to mention the service. While our waiter was nice and attentive, the lag time between courses was a bit significant. It took a while to get the wine we ordered, and then the wait time between dinner and dessert was pretty high as well. Since I’ve worked in the restaurant industry in the past, I definitely understand the timing between courses, but this seemed a bit excessive. I’d like to come back to Lark Creek and try some of their menu items and see if the service is still an issue. AND they have happy hour specials every day from 3-6. Weekend happy hour anyone? This entry was posted in California, Dinner, Fine Dining, Orange County and tagged fashion island, local, seasonal on February 27, 2014 by allie@sweetpotatobites.